What if you were to take an opinion poll in Bamako (a purely hypothetical case — such things almost never happen) and ask, “Which world leader do you hate most?” I’m quite certain Nicolas Sarkozy would top the list. This is a town where it’s possible to hear people express favorable opinions about everyone from Saddam Hussein to Muammar Gaddafi to Robert Mugabe and even, occasionally, George W. Bush. But I literally have never met a Bamakois with a kind word to say about Sarkozy. His rating among Malians only fell from there, and seemed to plunge ever deeper as Mali’s own fortunes fell. A good many people here see the sinister hand of Sarkozy behind the resurgence of the Tuareg-led rebellion earlier this year. It’s certainly true that the Tuareg have a sympathetic following among the French and that rebel spokesmen have frequently appeared in the French media. 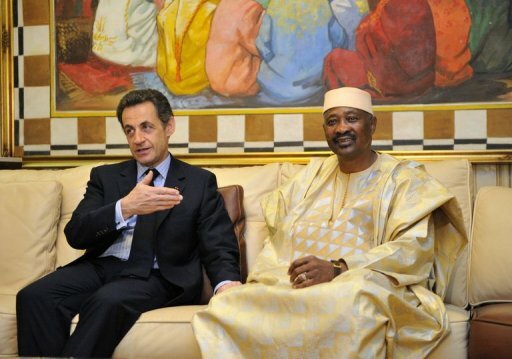 It’s also true that, through his support for NATO’s campaign to oust Gaddafi last year, Sarkozy helped bring about certain side effects such as the return of heavily armed Tuareg fighters to Mali. And there may well be French interest in certain natural resources that might someday be exploited in northern Mali. This evening it was announced that President Sarkozy narrowly lost his reelection bid to Socialist candidate François Hollande. People in Bamako now wonder, with a new resident soon to occupy the Elysée (France’s presidential palace), what will change for relations between Mali and France? Will “Françafrique,” the web of “incestuous relations” between top politicians of France and former French colonies in Africa that has existed since the 1960s, finally be dismantled? This entry was posted in Uncategorized and tagged France, Nicolas Sarkozy, politics. Bookmark the permalink. As always I am reading your texts with great interest. In my opinion there are factors that seem to confirm the hypothesis of French interference in Mali. The open letter of the French embassador you cite, although an example of pompous and hideous French rhetorics, did not criticize openly ATT or his government. At other occasions, this same embassador has criticized ATT in a way that would have brought about his expulsion in may other countries. – French minister Alain Juppé was present at the Cedeao/Ecowas meeting that decided on the sanctions against Mali (by the way, I wonder in what quality). There are facts, there is analysis of the facts and there are interpretations and fantasy. Then, of course, there is rhetoric, often containing a mixture of the above, used to improve or defend one’s image, interests, position. France is certainly no exception in using all of these in it’s rhetorics. At the beginning of his mandate, President Sarkozy anounced the end of Françafrique; many analists doubt that he succeeded completely in this or even seriously tried to do so. (I wonder what future president Hollande will do in this respect). So let’s have a look at the facts (without pretending to be exhaustive). It is a fact that French has nourished good relations with the MNLA and that the French ambassador has publicly spoken out against ATT. I do not know if he has officially been criticized for this. (Citing these facts is not the same as saying that France was trying to destabilize Mali or supporting the rebellion by the MNLA). It is also a fact that France has publicly spoken out against the rebellion by the MNLA, but it would be too easy to take this rhetoric at face value. It is another fact that French minister Alain Juppé was present at the Ecowas meeting. Perhaps only as an interested observer? Top politicians rarely limit themselves to observing. France is playing a role in Africa and this role has to be analyzed. Closing one’s eyes for this would be what anthropologist Didier Fassin calls “denial”. Is anyone denying that “France is playing a role in Africa”? I’m not sure what, if anything, you and I disagree about. As you point out, there’s a difference between France protecting its interests in the region and actively trying to destabilize it. I am always perplexed when I see people speaking of Françafriquein Mali’s case. I’d like to remind you that the first independent government in Mali was socialist, had its own currency and was a lot more independent than Senegal or Cote d’Ivoire. Absolutely true. I would certainly never have lumped Mali into the same category as those countries or others, like Togo, Gabon etc., that had maintained extremely close ties with Paris since independence. Since January 2013, however, many have wondered whether Hollande has been trying to draw Mali into the “Françafrique” fold.